We are so sure that our new DermaQ Duo will be a harmonious duet for the skin on your face and neck that we are offering you this challenge. Use Derma Q-Gel Duo for just 30 days. On day 31, if you don�t agree that the synergistically powerful combination of Derma Q-Gel Day Cream in the daytime and Derma Q-Gel Gold Drops at night has transformed the skin on your face and neck to be noticeably smoother and lovelier than it was on day one� than simply return the un-used portion of the Derma Q-Gel Day Cream and the empty jar of Derma Q-Gel Gold Drops. We�ll be surprised but we will promptly refund your full product purchase price, no questions asked! Derma Q-Gel� Day Cr�me (2oz.) uses the patented Biosolv� technology, which enhances the absorption of Coenzyme Q10 (Ubiquinone) and the reduced, bio-active form of CoQ10 (Ubiquinol) into the deep layers of the skin�s derma, providing increased hydration and antioxidant activity to promote cell renewal for protection against sun-induced skin aging. The Day Cr�me also contains Alpha Lipoic Acid � the naturally occurring coenzyme antioxidant which enhances the activity of Vitamin-C and Vitamin-E, and improves overall skin tone and texture. This tri-antioxidant combination helps to reduce the typical signs of skin aging and damage, and diminishes the appearance of fine lines and wrinkles. 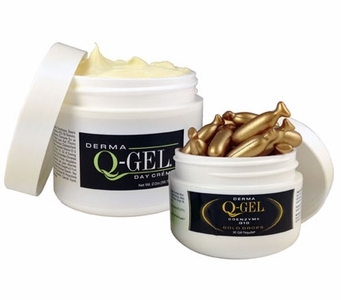 Derma Q-Gel� Gold Drops� (30 Snipgels) contains a high concentration of the patented (Q-Nol�), stabilized form of reduced Coenzyme Q10 (Ubiquinol), which decreases cellular oxidation, making skin smoother, firmer, and more youthful appearing. Gold Drops� also contains Hyaluronic Acid, which increases skin tissue moisture levels to improve skin elasticity and firmness. Use Derma Q-Gel Duo for just 30 days. It�s synergistically powerful combination of ingredients and patented delivery methods should reduce the appearance of wrinkles on your face and neck while enhancing your overall skin radiance. Best of all, you have nothing to lose but unwanted wrinkles!